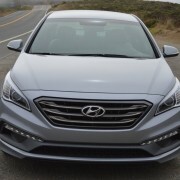 For the 2015 model year, Hyundai recast the mid-size Sonata, giving it better insulation, a roomier passenger compartment, and more up-to-date looks. For 2016, they added a hybrid version and a plug-in electric model good for 20 miles on a charge. 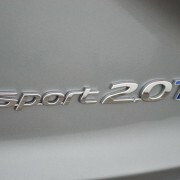 For sportier types seeking higher performance, the Sport model we test here features a 2.0 liter turbo motor packing a 245hp wallop. 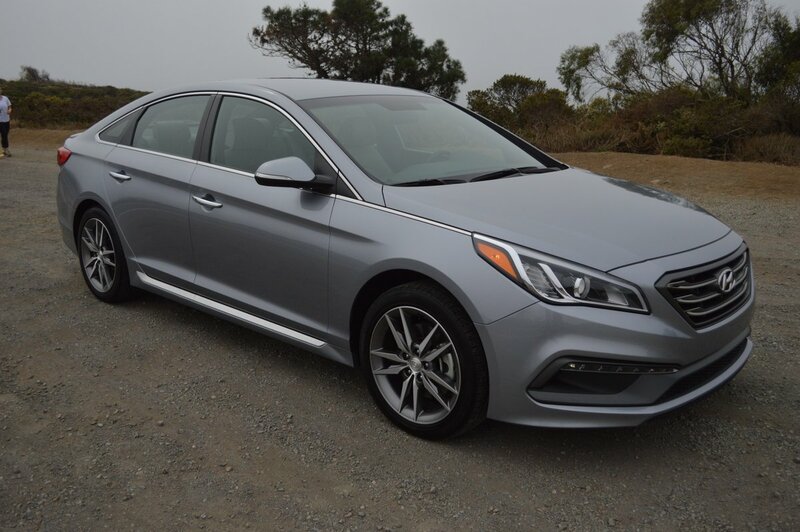 This svelte looking front-wheel-drive sedan is beautifully sculpted, with graceful lines stretching from the front end’s signature 7 LED driving light cluster to the tail’s rear diffuser containing quad exhaust tips. The inline 4 really gets with the acceleration program. It’s coupled to a 6-speed automatic gearbox featuring paddle shifts plus a manual control gate on the console stick as well. 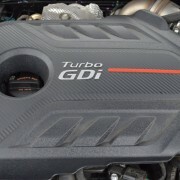 Since the engine makes 260lb.-ft. of torque all the way from 1,350rpm to 4,000rpm, you almost never need to bother with the paddles or gear selection. 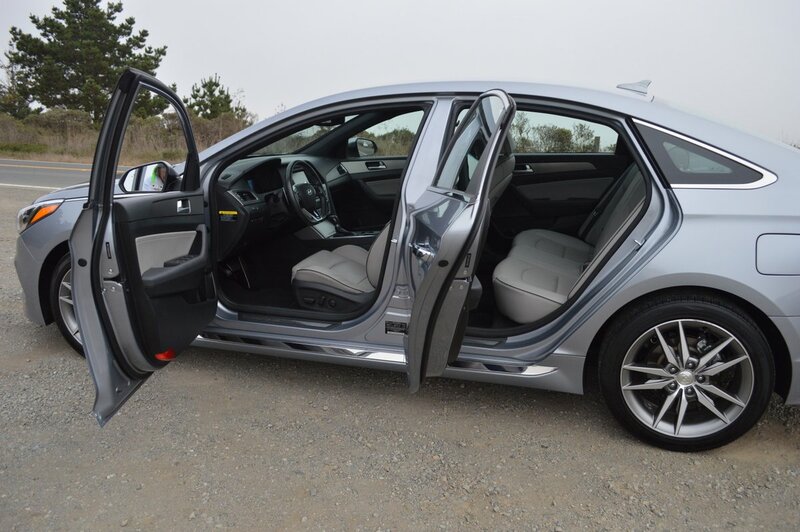 Just floor the Sport’s model-specific ribbed aluminum accelerator pedal, and enjoy this sedan’s prodigious passing prowess. When bidden, it jumps. 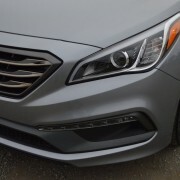 In addition to the exterior sporting clues, Hyundai has freshened the interior with such performance-oriented features as a D-shaped (flat bottom) steering wheel, and sport leather seating surfaces with standard front seat heating. These handsome pedestals are quite supportive during hard cornering maneuvers. 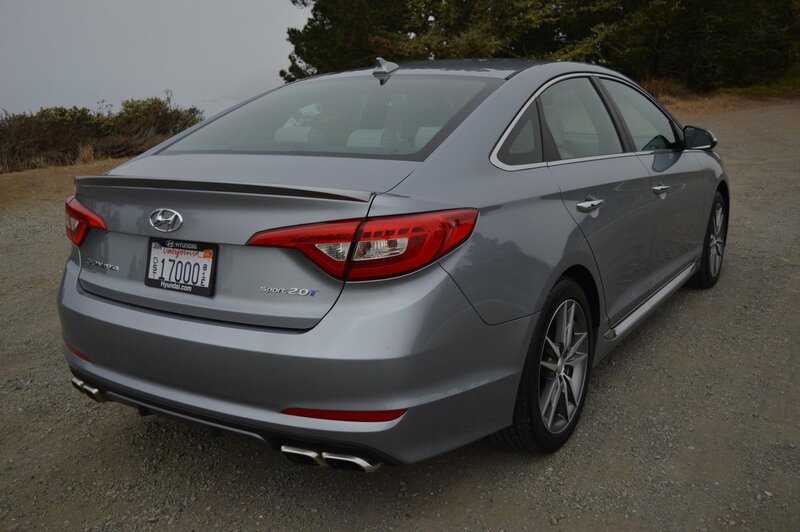 Sports-tuned suspension and steering help raise the lateral limits of the Sonata Sport. 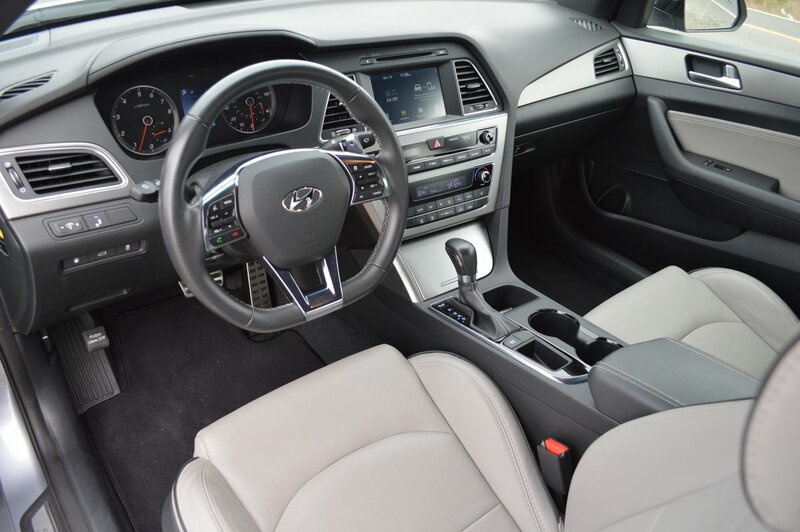 If the basic ride quality and steering feedback is too soft for your liking, you can engage a Sport setting via a “Drive Mode Select” button on the center console that stiffens the steering feedback, and favors higher rpm engine operation. 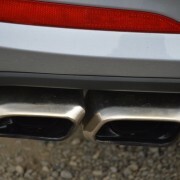 There’s also an Eco setting available which makes feedback sludgy and softens throttle response. 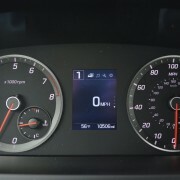 Really, the Sport Sonata is well enough tuned that you could easily do without either of these Drive Mode Select options. 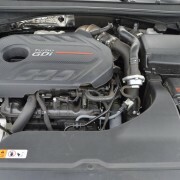 In fact, I chose to spend most of my week in Normal mode, which offered good steering response without artificial heaviness, and lower-rpm shift points which eliminated noise and jerkiness. 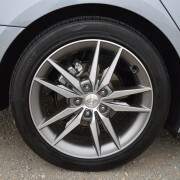 The standard 18 inch alloy rims bear mid-level Kumho Solus XT tires (235/45R18) that squeal when pushed to the limit. 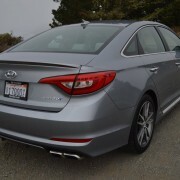 At that limit, this 3,315 pound sedan develops profound understeer, which is safe to control, but not very rewarding to manage. 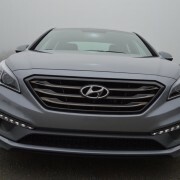 The list of standard attributes for the Sonata is long and surprisingly complete given its modest $28,925 base price. I really liked “Proximity Key Entry with Push Button Start,” since this allows you to approach the Sonata with hands full and slide right in without fumbling for keys. 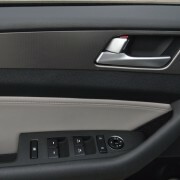 Likewise, once seated, just bump the large Start button on the dash while the key fob is still buried in your pocket or purse, and the Hyundai lights off without further ado. The remote fob also features a trunk release button that eases the toil you need to expend when loading groceries. 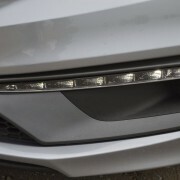 These are niceties that many sedans costing twice as much fail to offer as standard equipment. Our rear seat test rider commended the spaciousness of the aft passenger compartment, which is fitted with twin floor mounted rear vents for A/C and heat. 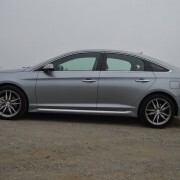 The cabin is quiet enough at 65mph to carry on a conversation with aft seat passengers, Despite the fact that our test Sonata lacked a sunroof, we hardly noticed its absence thanks to this sedan’s large and expansive side and rear windows. 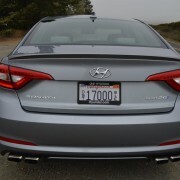 The Sonata is highly rated for crash safety by the US Government. It merits an overall score of 5 Stars, the highest evaluation available. It amasses this score by earning 5 stars for both front AND rear passenger, AND driver impact tests, plus 4 Stars for rollover rating. This highly rated protection accrues from front, side impact, side curtain and driver knee airbags. 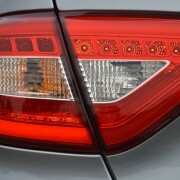 Additionally, the Sport offers standard blind-spot detection with rear cross-traffic alert. Although ABS brakes, with electronic brake force distribution and brake assist is a standard component of the Sport’s specification, the brakes on our high-mile (10,000 mile) test car were grabby and unpredictable. They failed to release when pressure on the pedal was removed. 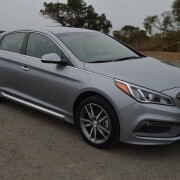 Aside from this foible, the Sonata Sport is well worth considering if you seek a family sedan with pretensions of performance at a modest price. 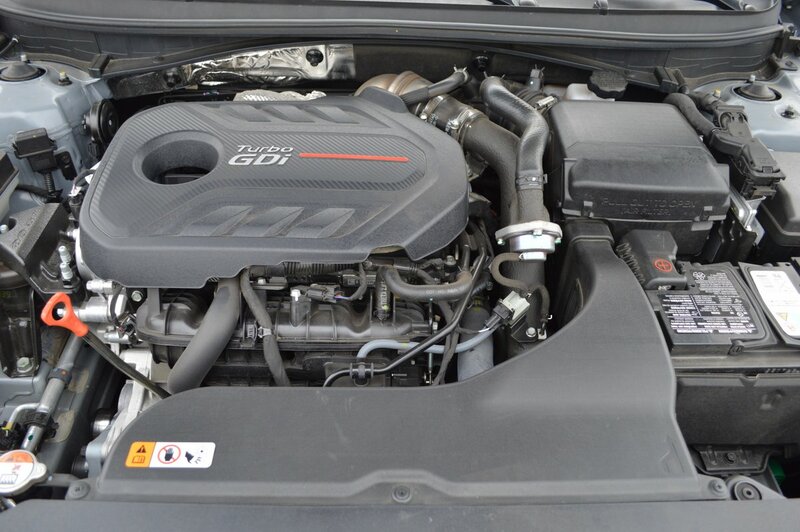 This Hyundai checks a lot of boxes for the money.